Love your library? Shout about it. I’m really upset by the recent proposed budget cuts in New Jersey that will reduce or remove internet access, databases, programming, and many more useful services from New Jersey Libraries. I’m upset that the new Administration finds certain things far more important than these services which have helped me to raise my children, become part of a community, and support my recent MA in Organizational Leadership. I’m upset that many of my friends in LibLand will lose their jobs, go without professional development, and have to divide already thin resources. With this development, I have revolution and revolt on the mind, and in our country, we have the right to speak out on that which we disagree with. My symbol for this is a bullhorn, a tool for rallying cries, to gather and direct people towards change, and to broadcast ideas and reminders about why we should be outraged. 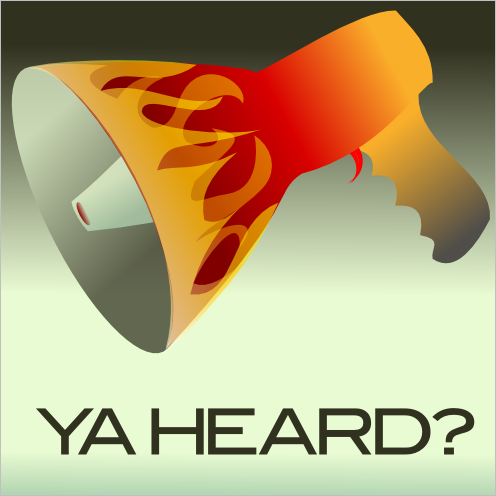 In Inkscape, I built the bullhorn mostly via the Bezier tool. I added flames with the Bezier tool. I added a handle with the Bezier tool. I created the central horn with the Bezier tool. I created the trigger with the pencil tool. The piece of text is from the Showtime series The Wire, in which one of the main characters says “Heard?” in such a way as for it to be almost a half syllable, and it means essentially “Do you understand and comply; if not, we are going to have trouble.” Anyway, a fun sketch about a very serious topic for me. If you love your library, tell someone — shout it out.